We'll, I came to do a return. I went to the till and put the shoes on the counter. The sales assistant walked over and advised me that her colleague was on her lunch break. Which meant no transactions could be processed through the till. I was confused and asked why, she responded with she's on her lunch and to come back after 3 o'clock when it was already 3:15. I couldn't quite understand why she couldn't do my return. Eventually after a few minutes she went and got her colleague from out the back and she came out and processed my return. But NOT ONCE did she say 'hello or look at me during the transaction. Overall very POOR customer service, staff obviously aren't trained well enough to do all types of transactions. And I'm just glad I won't be returning back to your store. I DO HOWEVER want to know what you will be doing to make your next customers experience a lot better than mine. 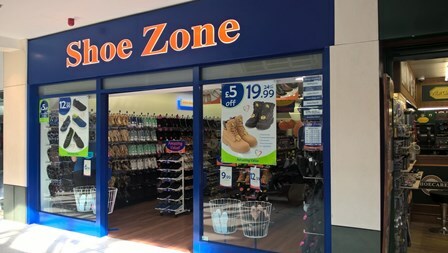 I went to shoe zone in Woking and bought a few pairs of shoes, house slippers etc and was tempted to buy the memory sponge office shoe. My size was not on the display, but the lady serving at the till was very helpful. She went to the store warehouse and got me my required pair. Thanks for this extra help.